After my mother died, I was going through her wooden recipe box and discovered a treasure trove of recipes from her, her mother and her grandmother. 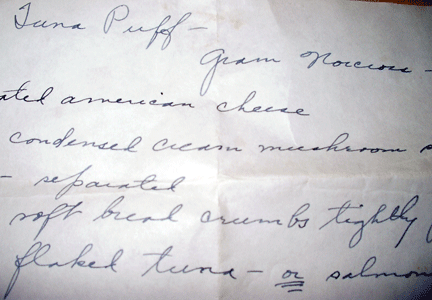 This one for a “Tuna Puff” really captured my heart, especially as is written in my beloved grandmother’s hand-writing. Gram Norcross, my great-grandmother, lived until I was thirteen. Four generations of women in our family have made her recipe. It interested me to read my grandmother’s comment at the bottom of this recipe, noting that it fed 5 people, with second helpings! Portion sizes were so different in those days. I love the old-fashioned name, but not necessarily the processed soup and American cheese. Next time, I will make my own seasoned white sauce and grate in some sharp cheddar. 1. Add cheese to soup and heat until cheese has melted. Remove from heat. Preheat oven to 350 degrees. 2. Beat egg yolks slightly – then add a little of the mixture to them and mix well. Then stir in the rest of the yolks into the cheese mix. Add bread crumbs and tuna. 3. Beat egg whites until stiff and fold into mixture. Pour into 2 quart casserole and bake for 45 minutes. Your Gram Norcross’s Tuna Puff recipe brings sweet tears to my eyes as I remember my ‘hands on’ lesson for making the family Salmon Loaf. It includes “make a slurry of the drained salmon, eggs, crushed crackers” . . . . perhaps I’ll try write it down. It is delicious indeed.